If you didn’t use Setup Assistant, the best way to copy your keychains to a new computer is to export and then import them using Keychain Access. See Import and export keychain items. 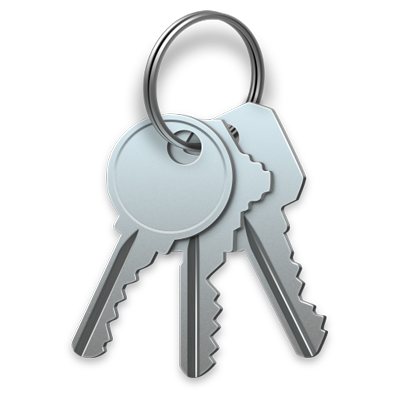 However, you can also manually copy your keychains to another Mac using the steps below. On your Mac, locate the keychain files you want to transfer. Keychains are usually located in the Keychains folder in the Library folder in your home folder. To locate these files, press and hold the Option key and choose Go > Library, then open the Keychains folder. Select the keychains you want, then press and hold the Option key and drag the selected keychains into another folder to copy them to the folder. Keychain files typically end with .keychain-db. Don’t select and copy encrypted folders with names that appear as a series of numbers. Transfer the folder containing the keychains to the new computer. Important: Transfer the keychains in a safe manner so no unauthorized person can access them. For example, use AirDrop or a USB flash drive to copy the files. Change the name of the transferred keychains on your new computer so they don’t become confused with any of the existing keychains. This is especially important if you are copying a standard keychain, such as the login keychain. Open Keychain Access, located in the Utilities folder in the Applications folder. Add each copied keychain one by one by choosing File > Add Keychain, selecting your keychain, then clicking OK. Important: Be sure not to leave your keychain on any computer that is not secure. Doing so may allow other users to access items with your keychain. To access the items in the keychain on the new computer, you must use the same password you used for the keychain on the previous computer. Note: You can’t copy passwords stored in your iCloud keychain. To transfer these keychain items to another computer, set up iCloud keychain on the other computer using your iCloud user name and password.